Britain’s banks still want to lend to small businesses …but in today’s credit crunch climate many enterprises now lack the confidence to even apply for substantial loans. John Addison, Head of Small Business at Barclays Bank in Birmingham told delegates at an ‘Accessing Finance’ seminar held at Aston Science Park: "As a bank we are currently sanctioning four out of every five business plans submitted to us. " "We are definitely open for business and we are a bank that likes to say ‘yes’ – but, like everyone else, we are running a business and on occasions we may say ‘no.’ But what surprises me at the moment is that since the launch earlier this month of the government’s new Enterprise Finance Guarantee (EFG) scheme, which enables businesses with an annual turnover of up to £25 million to secure loans up to £1 million, we have only received six applications, four of which have been approved. "Normally, I would expect to be receiving at least six applications every day – but perhaps this reflects a lack of confidence amongst customers who believe that banks generally are now not open for business. It could be that some people just do not know about it. Or, as the scheme was only announced on January 14, maybe they are not yet fully aware of the proposals," he added. "Understandably, there is a lot of negativity at the moment and we know that people are not approaching the banks for help simply because they think that the banks will say ‘no.’ However, as the EFG scheme is new, we are taking steps to ensure that our staff know about, and understand it, so that they, in turn, can make customers aware." 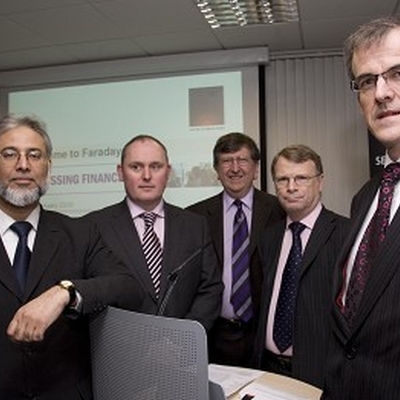 Mr Addison, who also urged SMEs to produce focused, robust, business plans when seeking financial assistance, made his comments at a seminar co-hosted by the Fair Finance Consortium (FFC) and the West Midlands Minority Ethnic Business Forum to highlight alternative sources of finance which are available to businesses as distinct to lending from traditional High Street banks. Ex-banker Dr Steve Walker, who as chief executive of Aston Reinvestment Trust (ART), a member of FFC, has practical experience of the challenges faced by SMEs in acquiring loan and equity support, said that many Community Development Finance Institutions (CDFIs) such as ART, have started and grown over the last twelve years to enable businesses to access finance when their banks can’t help. They typically lend up to £50,000 -for any business purpose – either on their own or alongside the banks and other lenders as part of a finance package. "CDFI lending in the West Midlands has trebled in the last quarter of 2008," he added, "and there is still plenty of money to lend." Dr Walker said that feed-back from delegates had highlighted that most of them were unaware that there was still so much money available to support them. In fact there are many different sources or kinds of finance available to SMEs in the West Midlands. As the banks are predominantly low cost, low risk lenders – even more than usual in the current economic climate – businesses without a trading history, smaller businesses or those whose plans for expansion or diversification are perceived as more risky have a higher chance of getting the finance they need from alternative sources, including a combination of sources. Patrick Palmer, Head of Access to Finance at regional development agency Advantage West Midlands, who said it was vital that small businesses should be made aware of the various funding options that were currently available, said that there had been a huge increase in demand for CDFI money during the current economic climate. However, one of the most significant loan finance schemes in the region at the moment was the £9 million Advantage Transition Bridge Fund (ATBF), which had been created to help viable businesses which were having difficulties obtaining credit from banks and other mainstream providers between £50,000 and £250,000. Mr Palmer said that to date over 400 enquiries had been received from businesses seeking ATBF loans and that 90 applicants, including a number of SMEs, had between them been offered a total of £4.2 million. He added that as a result of working with the private sector, to identify gaps in the supply of finance, Advantage West Midlands had been able to support a substantial number of SME focused financial initiatives, including the Mercia Technology Seed Fund, Business Angel schemes, the Advantage Early Growth Fund and Investbx, the first virtual trading platform of its kind in Britain to help businesses raise equity finance of up to £2 million. Franchise operator Tony Sealey, chairman of Black Business in Birmingham (3b) and a member of both the national and regional minority ethnic business forums, said that the SME community, which employed 14 million people in the UK, was vital to the national economy. Urging companies to take advantage of Business Link and the business support system, he said: "We are fortunate in this region in that there are a variety of available financial options. But right now there is a cash flow challenge – cash flow will either keep or kill a business. There is also a fear in the system – that lenders will lose money, even where government is guaranteeing part of that debt." Mohammad Nazir, chairman of the West Midlands Minority Ethnic Business Forum, who chaired the seminar, said it was indicative of the increasing concern amongst local businesses that the over-subscribed event had been attended by a capacity audience of over 100. "If companies are to survive this now deep-rooted credit crunch, they have to know what financial assistance is being offered," he said.